1. Preheat the oven to 180˚C, gas mark 4. Grease and line an 18cm square cake tin with baking parchment. Put all the cake ingredients apart from the walnuts in a food mixer; mix for a few minutes, until light and soft (or use handheld electric beaters). Fold in the chopped walnuts and spoon the mixture into the prepared tin. Smooth the top with the back of a spoon. 2. Bake for 25-30 minutes, until risen and golden. (If in doubt, test to see if it is cooked using a wooden skewer.) Allow the cake to cool in the tin for 5 minutes, then turn out onto a wire rack to cool completely. 3. Make the icing by mixing the instant coffee with 1 tbsp hot water. Mix into the sifted icing sugar to make a thick icing, adding a few more drops of water, if need be. 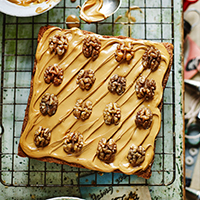 Spread over the cake, then dot with the walnut halves.